What investments are in a drawdown investment fund? The main purpose of using investment funds over single company shares is to minimise risk. 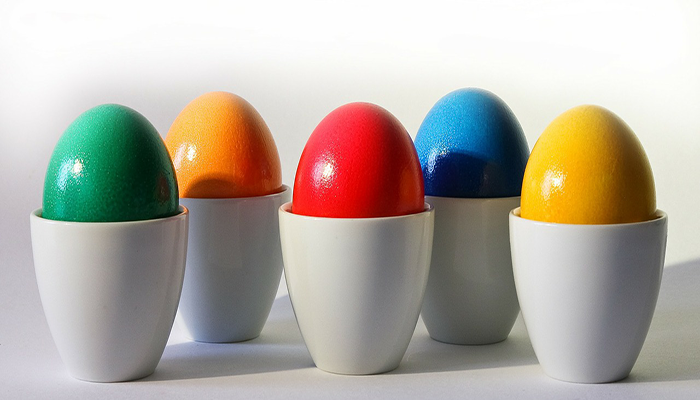 It’s commonly called diversification but the concept is the well-known phrase not putting all your eggs in one basket. There are a number of ways in which an investment fund spreads the risk. There are opportunities to invest for growth in every part of the world. Some economies are more developed such as North America, UK, and Central Europe. The larger companies within these area should be more predictable and therefore less volatile. There are also less developed markets such as India, parts of South America and Africa and part of Asia. These are known as emerging markets. They carry more risk in terms of volatility but can provide great potential returns (or losses). Different regions offer different opportunities and associated risk. A global investment fund will have a mixture of these so that if one area is affected others may mitigate that risk. There are often region specific funds also. These will be focused on a specific geographical region for example UK equity. This fund will be more specialised in this area and theoretically should be able to offer better growth. This is because the research team will be located in this region and have a better understanding of the opportunities, company value, competition and market forces which may provide growth potential. Rather than investing in one global fund, a portfolio may contain 5 funds which have specific regional funds within it. The theory being investment managers of the region specific funds will have more of a handle on their market than one global fund manager, who can’t keep track on all things in all regions. 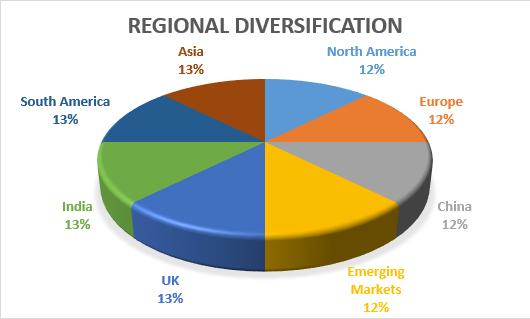 The advantage of choosing to build a portfolio from region specific funds is the ability to exclude regions which you may have a desire to avoid. The recent turmoil in Russian being one example. 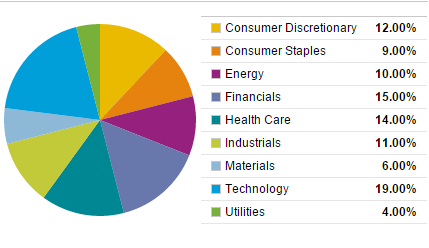 As well as spreading the risk between different countries, fund manager will also invest in different sectors. Different sectors offer opportunities for different growth potential. There are established sectors and new sectors. Banking for example is an established sector where as some healthcare sectors like biotechnology are rapidly advancing, technology lead new areas. A global fund manager will diversify in sectors as well as countries, but just like there are regional funds there are sector specific funds. There are healthcare, technology and financial specific funds just to name three. Again the advantage of these type of funds is they can be more specialised in a specific sector. The research will be focused within this area and therefore more knowledge should be available to the fund manager than a simple global fund. Diversifying into different sectors will again reduce risk to a fund. If one sector is under pressure, it won’t necessarily impact other sectors and there the overall impact could be diluted. The third way in which a portfolio is diversified is by asset class. These are groups of investment which have a common link with risk and performance. 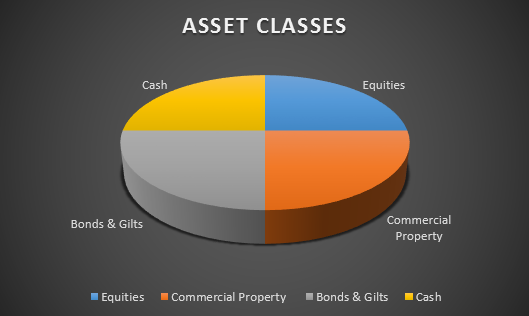 The four main asset classes are Equities (shares), Commercial Property, Gilts/Bond and Cash. Shares carry the most risk but offer the greatest return potential, these are direct investments in a company and are traded on stock markets. Supply, demand and perception of a company’s strength will have an impact on the performance of their share price. Commercial Property may be a fund which buys offices or commercial space such as shopping centres to rent out. Value will be determined from property price movement and rental return of the underlying investment. Bonds and Gilts are loans to companies or Governments for a given return. A company will generally pay a higher annual return than a government as they are more at risk of defaulting. These types of investment offer a more steady return (often referred to as fixed interest) as they pay a known interest return. These can also be traded however and if deposit interest rates are low, a high yielding bond will be more attractive as a better interest can be achieved from that than putting money in a bank account. Cash is the least risky of the four asset classes. The returns are somewhat predicable, have low volatility but offer the lowest potential return. Cash is simply that, a cash deposit with an institution which will offer an interest rate if you deposit it with them, much the same as your bank account would. The percentage invested in each of these areas will be determined by your attitude to investment risk and how long you wish to keep your money invested. You should always assess you risk profile before choosing a selection of invests. If you are unsure as to whether drawdown is right for you we like Fidelity’s Retirement Option Tool. If you like the idea of drawdown and wish to know what types of investment you should be looking at, Standard life can help you assess your attitude to investment risk. If you take financial advice your adviser will do this through questioning and the use of some tools.